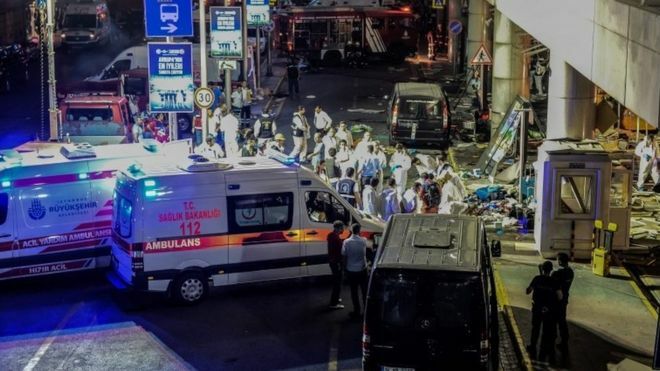 The death toll in a suicide gun and bomb attack on Istanbul’s Ataturk airport rises to 41, including 13 foreign nationals, as Turkey observes a national day of mourning. There has been no claim of responsibility as yet. The attack was a sophisticated dual attack with guns and extremely powerful bombs don’t used until this attack. Below is a picture of the Delhi International Airport . 34 million passengers travel through this airport in the capital city of India each year. Because of the terrorist attack in Mumbai on 26/11/2008 , there is extremely tight security. During our time in India we took quite a few in country flights in order to visit all the places we did with the students. I thought I would share the level of security which we found at this airport. We had spent the night at a hotel near the airport and that was the beginning of the intense security. At the entrance of the hotel, there was a mirror check under the bus for a bomb before we disembarked. Next , just inside the entrance , there was a X-ray machine similar to the ones in airports where we had to put our luggage, purses, and carny-on luggage and stand there until our luggage was screened successfully. Immediately stopping at the entrance the next morning, we noticed a change from airports at home. We were told to show our passport as we quickly left the bus, and headed for the door which was a very short distance. Entering we were asked to show our passport again and to immediately place our luggage , purses, and computers in another x-ray machine. We were then ushered into a group waiting area, and were checked in showing our passport again. No one is allowed to fly if your name is not spelled correctly on the ticket as it appears on your passport. Checked luggage is taken at this point, boarding passes given and we were off to the personal security in separate lines by gender. Passport, pat downs, and a once over with a wand , but interestingly no removal of shoes. Next we go to get our carry-ons showing our passport again. A security person has to give us a tag for each piece of carry-on on which you must write your name, the flight number and destination. Now we could sit down for a little while. Lastly, our flight was called and we line-up again. As we leave the airport to board the plane, a guard checks to see if we have the tied on tags, that it has the proper information, looks at our passport and we enter the plane if all is in order! I have never flown El Al but I know its security is even stricter including a personal questioning of each passenger. This entry was posted in Delhi, India, Travel, Uncategorized and tagged Delhi Ghandi Airport, European airport attract, Istanbul, Istanbul Atatirk Airport attack, security at Delhi airport. Bookmark the permalink. This attack was similar to the recent one at Brussels airport. Same modus operandi. Yes, such huge bomb blasts even took down ceiling tiles!